The Municipal Art Society of New York (MAS) believes the Inwood rezoning proposal comes at a vital juncture for the neighborhood. While the time is ripe for a comprehensive rezoning to frame Inwood’s future, growth must be balanced with equitable protections for the community and the many elements that make it such a special place. Adequate and appropriate safeguards must be put in place through the rezoning that protect Inwood’s community character. Inwood is truly a unique neighborhood. It sits at the northern tip of Manhattan, characterized by its hilly topography, bountiful parks, historic resources, relationship to the water, and diverse population. It is this long-standing population—the residents and businesses—that must be protected for the rezoning to successful. 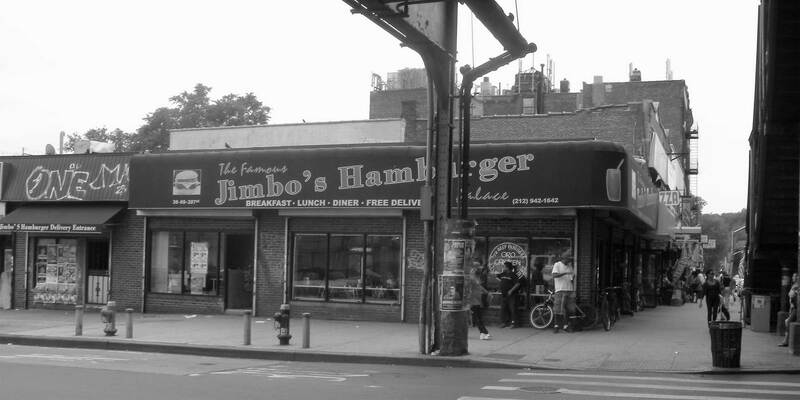 Jimbo's Hamburger on 207th Street in Inwood. Photo: Wikimedia Commons, Jim Henderson. MAS is encouraged by the Inwood NYC Action Plan that frames the rezoning proposal, in particular its plans for the Inwood Affordable Housing and Library site, the level of outreach to local residents to support tenants’ rights, investments in infrastructure, and support of neighborhood businesses through grant programs. However, we remain concerned about the potential for low-income residents to be displaced, the gentrification of retail establishments, and the potential long-term effects future development will have on cultural and natural resources. The rezoning affects a 59-block, 230-acre area. By the 2032 build year, the rezoning would result in an incremental increase of 4,397 dwelling units, including 1,379 or 1,618 affordable units, depending on which Mandatory Inclusionary Housing (MIH) option is selected, and 12,224 new residents to the area. With the rezoning, Inwood’s population would increase by nearly 30 percent in less than 15 years. In terms of land use, the proposal would add 1.2 million square feet (sf) of commercial space, the most of any City-led rezoning, almost a half-million- sf of community facility space, and a 50,000 sf decrease in light industrial space. As is the case with other City-led rezoning proposals, MAS finds the Reasonable Worst Case Development Scenario (RWCDS) that frames the analysis in the Final Environmental Impact Statement (FEIS) does not accurately represent the most conservative development projection under the zoning proposal because it does not take into account rent-stabilized and underbuilt residential buildings. This is an important distinction in the evaluation of socioeconomic conditions in Inwood where approximately 70 to 80 percent of housing units are rent-stabilized or rent-regulated. Therefore, the RWCDS should include applicable rent-stabilized and underbuilt units in the rezoning project area. We have also found that the FEIS does not include a description of the proposed development at sites 2A and 2B, part of the Columbia Presbyterian Hospital expansion in the “Tip of Manhattan Subdistrict.” The expansion is expected to result in a half-million sf of new development, including a quarter-million sf of medical office space and nearly a quarter-million sf of research office space. Given the size of the proposed development, MAS finds the lack of details on the development sites to be a glaring deficiency in the FEIS evaluation. The development of market-rate buildings may increase the demand to redevelop multifamily dwellings outside the soft sites. Our concern is that by increasing density near a large number of buildings with rent-stabilized units, additional redevelopment pressure could be put on nearby properties, which in turn could lead to potential indirect displacement of low-income residents. These concerns are magnified by the fact that a quarter of Inwood’s households live below the poverty line. Because the FEIS does not evaluate the potential impacts of illegal conversions of rent-stabilized units or the increase of preferential rents, the full impact of the rezoning is not known. The rezoning area adjacent to the Harlem River is within the 100-year floodplain. Although the FEIS identifies a transfer of development rights program and construction standards for resiliency and flood mitigation, MAS recommends additional and more stringent measures. We urge the City to further reduce or restrict development in flood prone areas and encourage stronger flood mitigation infrastructure not only to reduce loss of life and destruction of property, but also to minimize the impact of local Combined Sewage Overflow (CSO) events in the Harlem River. In 2016 alone, 38 CSO events occurred at one outfall in Inwood, accounting for 18 million gallons of raw sewage and stormwater runoff pouring directly into the Harlem River. According to the FEIS, the 33 projected development sites would generate 1.4 million additional gallons of sewage, a 567 percent increase over No-Action conditions. The FEIS mentions that a new drainage plan is being developed for the area that would address future capacity requirements. However, the Water and Sewer Infrastructure evaluation concludes that no adverse impacts to wastewater would occur as a result of the rezoning. Given the existing high levels of water contamination in the Harlem River, we find this conclusion to be premature. The failure to create and disclose the findings and recommendations of a drainage plan and how it would be implemented in the rezoning area to minimize future impacts renders the analysis incomplete. With more than 12,000 new residents anticipated, the rezoning could drastically change the socioeconomic conditions of the Inwood community. Therefore, for a proposal that touts affordable housing as a primary objective, we find the FEIS analysis incomplete because it does not identify or evaluate an MIH income band. This omission, including a lack details on unit size and number of bedrooms anticipated for the affordable dwelling units, raises questions about the completeness of the FEIS with respect to housing affordability. It is critical that the Inwood community is informed of the number of affordable units that would be created in the rezoning area and the level of affordability offered. This is particularly important in light of the Broadway-Sherman Avenue Rezoning in 2016, which was eventually rejected by the City Council based on questions about the project’s level of affordability. Without this disclosure, the community does not have sufficient information to assess this critical component of the rezoning. According to U.S Census (2011/2015 American Community Survey data) 29 percent of the households in Community District 12 have an income that is less than 30 percent of the Area Median Income (AMI), $24,500 for a three-person household. The deepest affordability option under MIH would require that 20 percent of the residential floor area be affordable to households earning 40 percent of AMI ($32,640 for a three-person household). Another option under MIH provides dwelling units affordable at 60 percent of AMI ($49,000 for a three-person household) which is above the neighborhood’s median household income of $41,700. Based on these options, MAS recommends that the deepest level of affordability be evaluated to ensure that affordable housing is within reach for the greatest number of existing residents. We also recommend that the City explore deeper levels of affordability and include them in the Alternatives Analysis in the FEIS. It is refreshing to see the City’s commitment to local affordability though the Inwood Affordable Housing and Library Development Project to create a 100 percent affordable development of 175 units. In particular, new affordable units at the library site will be affordable to households earning between $20,000 and $40,000 per year serving a key demographic of extremely low-income households that most need affordable units. The project is expected to directly displace more than 300 employees in local businesses. No mitigation measures have been identified to offset the impact, especially the Super Associated Marketplace and Compare Foods grocery stores that been identified as potential development sites. While it is possible that new grocery stores will be constructed under the proposed rezoning, it is imperative that practical and affordable grocery shopping options are available for residents. Therefore, we expect the rezoning to be revised to include protections so that certain areas do not become food deserts. The FEIS states that approximately 31 businesses would be directly displaced by new development under the rezoning. MAS believes there should be mitigation measures to facilitate the relocation of these businesses such as relocation assistance and grants from the Department of Small Business Services. Most of the proposed and potential development sites in the rezoning area have commercial uses and will be rezoned to mixed-use districts. The addition of a large influx of residents with incomes well above the neighborhood average raises substantial concerns of retail gentrification. These residents are likely to demand goods and services from retailers that are not currently available in the neighborhood. MAS is concerned that local businesses will be pushed out of the neighborhood. The FEIS states that the rezoning may lead to increases in area retail rents due to higher demand brought by new residents. However, the analysis obscures the possibility that new residents’ tastes will differ from those currently living in Inwood. While Inwood is a hub of Dominican culture today, with shops and restaurants catering to the local Dominican population, incoming residents are unlikely to demand the same retail opportunities. MAS feels that it is inappropriate not to address these factors in the FEIS. The City must devise a plan including protection measures to prevent, to the extent practicable, indirect business displacement. Significant questions remain about how the rezoning would affect school capacity in the area and the analysis of school capacity in the FEIS. With an enrollment of 7,779, elementary schools in Community School District 6 were at 101 percent capacity last year. However, according to the FEIS No-Action development scenario, enrollment will decrease to 6,209 by 2032, a drop-off of over 1,500 students in the next 14 years. We find the FEIS and subsequent responses lacking in explaining the marked drop-off and how it translates to the number of elementary school students anticipated in 2032. While MAS supports the development of the New York Public Library site, and we are appreciative that the City has planned for a larger library space, the FEIS fails to provide specific information on the expected timeline for library construction and the specific location of the temporary library. These key omissions could have significant impacts on the local community and we ask the City to disclose this information. The evaluation of shadow impacts on the Harlem River is inadequate. According to the FEIS, development under the proposed rezoning would result in five to six hours of incremental shadows on the Harlem River throughout the year. The Harlem River is both an essential fish habitat and an impaired river, due to the presence of pollutants, according to the EPA. MAS appreciates the inclusion of additional analysis in the FEIS regarding the impact of shadows on fish species in the Harlem River. However, MAS urges the City to explore design changes for future development that would reduce shadow impacts in the Harlem River. The Dyckman Farmhouse, which is both a National Historic and individual New York City landmark, is at Broadway and West 204th Street, directly within the Commercial “U” sub-district for which an upzoning is proposed. The Dyckman Farmhouse must be protected from the impacts of construction from nearby developments. The Inwood area has a potential trove of archaeological resources. According to a Phase 1A Archaeological Assessment, conducted as part of the FEIS and reviewed by the Landmarks Preservation Commission (LPC), eleven projected development sites and six potential development sites may contain archaeological artifacts. LPC recommended that archaeological testing be done before any development can occur on these sites. While City-owned development properties, including site 25, will conduct archaeological studies prior to excavation and construction, the FEIS states that no measures are in place to require archaeological testing for private developers apart from the reporting of any human remains, should they be unearthed. MAS finds the lack of protection for potential archeological resources disconcerting. Given the likelihood of these assets, we urge the City to require that all archaeological remains found in the Inwood area be documented and that the proper authorities, including the LPC, be notified. The FEIS evaluates three alternatives: No-Action, Proposed Action, and a Lower Density Alternative. To provide a wide range of potential development options, MAS is disappointed that the FEIS does not evaluate an alternative in which the rezoning only takes place east of 10th Avenue and the impacts are primarily constrained to business displacement in the Sherman Creek area. This alternative scenario restricting development to the east of 10th Avenue would have allowed new development while maintaining the building scale and character of the heart of the neighborhood. MAS recognizes how critical the rezoning proposal is for the future of the Inwood. With the influx of such a large number of new residents and the expected development the rezoning will facilitate, Inwood is surely set to change. In light of the imminent changes, the City must do all it can to ensure that new growth is carefully integrated equitably and protects all the elements that make Inwood a special place. Particularly its people. We find that a rezoning in Inwood is prudent given the changes that the neighborhood has seen in recent years. However, our concerns need to be addressed in the current proposal before we can support it. We urge the City to incorporate our recommendations into the proposal. Thank you for the opportunity to provide comments on this critical rezoning.